*An early increase in PD-1+ CD8 T cells appears important. 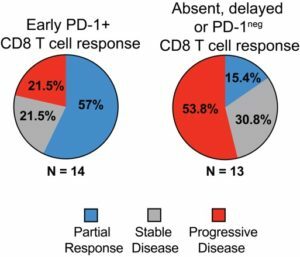 Having a CD8 T cell response after four weeks or a mostly PD-1-negative response was an indicator against clinical benefit– please see pie chart below or the PNAS paper (main and supplemental) for outcome details. All patients with partial responses survived at least one year, while just one with progressive disease survived one year after treatment initiation. Survival data was not available for three patients with progressive disease. *Similar findings from Penn with melanoma patients were published in April in Nature. *The Emory/Winship study began before the FDA approval of pembrolizumab last fall as a first-line treatment for non-small cell lung cancer. Most of the patients described in the PNAS paper had already received chemotherapy and/or radiation before immunotherapy. *A test of PD-L1 levels, obtained via biopsy, is now used to decide whether to initiate immunotherapy drugs in lung cancer. The test can be interpreted as a measure of whether the tumor site is inflamed at baseline, which may be complementary to information from the blood about the immune response. *Recent radiation treatment seemed to elevate baseline CD8 T cell levels for two patients in the PNAS paper. That’s significant when trying to figure out how to combine radiation with immunotherapy. Winship investigators are using the information obtained from this study to guide the design of studies following radiation with immunotherapy for small cell lung cancer.